Since the 1870's, the 12 gauge shotgun has been a classic shotgun for protecting your house, hunting, and sport shooting and has even been used in the military. With the firepower and effectiveness that the 12 gauge boasts, it comes as no surprise that this is the most popular shotgun in America. 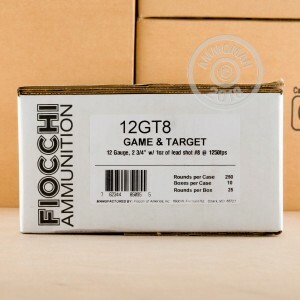 Fiocchi is one of the top firearms and ammunition manufacturers in the world. 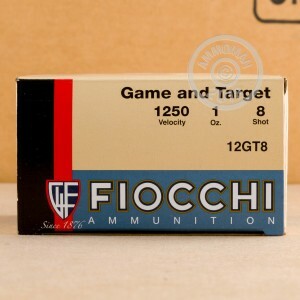 Still owned and managed by the founding family, Fiocchi puts their heart and soul into every round they make, insuring that only the best ammo is shipped out. 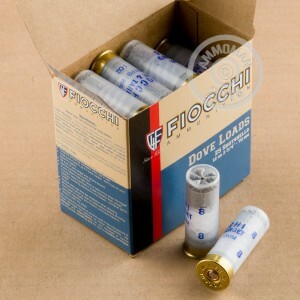 These 2 3/4", one ounce, #8 shot, Game and Target shells from Fiocchi are just the high quality shells you need to go both small game hunting and blast clays out of the air.